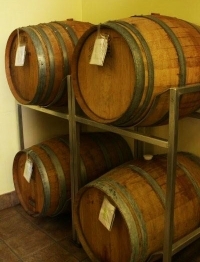 Valley Vines to Wines provides bulk-aging in oak barrels for our customers with up to 10 barrels going at any one time. The aging process involves putting 10 batches of the same wine into an oak barrel where it enjoys protected breathing through the oak. If you have experienced the difference time in the bottle makes to your wine, then you’ll be a fan of our barrel-aging process. The oak barrel does the same job quicker and gives you a wine that is as much as 6 months ahead in the aging process. We have several customers, in fact, that age all of their red wines in oak barrels. We use reconditioned barrels that impart very little oak to the wine but the benefit of allowing the wine to breathe through the oak comes through in the finished product. If we used new barrels there would be a strong oak flavour that would compete with the balancing already perfected by our winemaker who already creates the kits with the appropriate oak to fruit balance. We also have a select number of small oak barrels for single batches. Please check in-store for a list of the barrels currently available. Note: Limited Edition start dates will be subject to demand and number of barrels needed. 1 barrel has been reserved for each wine but can be adjusted to demand. Order by November 30, 2018.